‘Inflammation’ is a common word in the doctor’s office, and chances are you’ve heard of it. It’s the irritating, painful, and red swelling that appears after a trauma to the area… and you wish it would go away. During inflammation, our body’s white blood cells and other substances rush to the target area to protect it from foreign objects, mainly microbes. The swelling you see is a leak of some of that fluid into the tissue. It can be painful if it stimulates the nerves. In some diseases, such as arthritis and tendonitis, inflammation occurs even without the trigger of a foreign substance. This is when your body’s own immune system causes damage to its own tissues. Though there is medication to alleviate the pain, you can address inflammation through your diet to relieve symptons, and even prevent the condition before it becomes an issue. You probably remember your mom nagging about you not finishing your veggies, and it’s actually for a good reason. 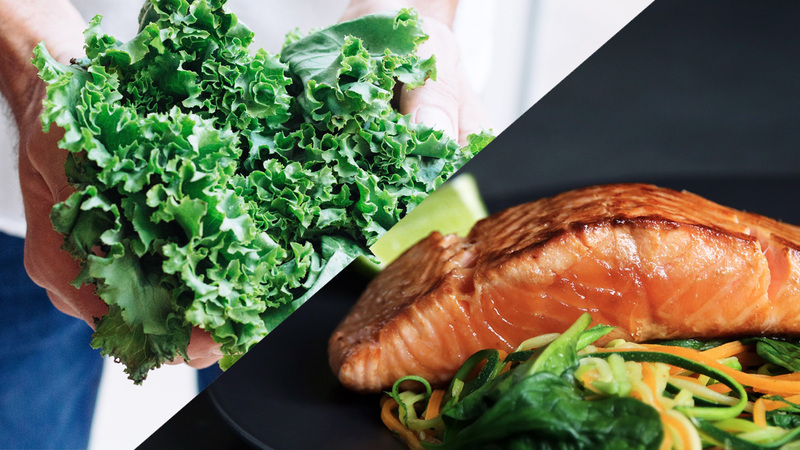 As it turns out, dark leafy greens contain significant concentrations of vitamins and nutrients that reduce chronic inflammation. These include vitamins A, D, E, and K.
If you constantly find yourself feeling ‘snacky’, you should probably lay off the processed chips and crackers that may actually be a factor contributing to chronic inflammation. Instead, replace them with nuts. A study in the American Journal of Clinical Informationfound that people who consume nuts five times a week had lower levels of inflammation markers. Some nuts are rich in vitamin E, l-arganine, and magnesium which may be important in keeping inflammation at bay. Whenever you’re having a salad, remember to include a dash of olive oil. Healthy oils and fats have a higher amount of unsaturated fatty acids relative to their saturated fatty acids. Aside from being good for your brain and heart health, healthy oils are rich in vitamins and fatty acids that help fight inflammation. Olive oil, for example, is rich in oleic acid which helps minimize inflammation. Grapeseed oil, on the other hand, is a good source for vitamin E.
Now, before the thought of onion breath clouds your judgement, you should know that onions are super healthy for you. They are extremely low in calories, barely have any fat, and are full of antioxidants. Quercetin, an antioxidant, has shown to inhibit leukotrienes and prostaglandins which are contributors to inflammation. All onions are full of health benefits, but not all onions are created equal; shallots, yellow, and red onions are the richest in disease-fighting chemicals. I wouldn’t consider tea as food, but due to its popularity and health benefits that most people aren’t aware of, I’ve got to include this warm (or iced) delight! Green, black, and oolong tea are rich with polyphenols. They all come from the same plant, Camellia sinensis.This compound helps boost the immune system and may protect against diseases such as arthritis. The EGCG in green tea has been found to block interleukin-1, a cell that is pro-inflammatory resulting from damaging cartilage. Your go-to seasoning for almost everything has a surprising health benefit: Aside from packing a punch in flavor, black pepper is great at reducing inflammation. Piperine, a chemical compound in black pepper, is effective in reducing inflammation, even at low doses. There you have it, 7 healthy foods to fight inflammation! It doesn’t have to be complex, and you don’t need to complicate your grocery store visits. If you’re a fan of the Keto diet, most of the foods I list here are keto-friendly, but you can find a full list of keto-friendly foods on Perfect Keto. I’m sure you already have at least one or two of these foods somewhere in your pantry. All you need to do is remain consistent, while also trying to reduce foods that can cause inflammation. You’ll be surprised by how much inflammatory-causing foods you consume in a day. Sarah is the Content Director at Perfect Keto, with a mission to help as many people as possible achieve optimal health and well-being.